My most recent investigations have been in and around a classic question in squatting study – legalization. Behind that Latinism lie many twisting paths and frequent monsters. It's both a desideratum and a “false friend.” One big road opened up a couple years back – the electoral movement called municipalism. And there's a lot of talk about it – what it did and didn't do. As I started to write of this busy spring in Madrid, I was going to some days of talk around urban commons(es), called the “Máster” en Comunes Urbanos. (That's a joke on a recent political scandal which led to the resignation of the PP leader of the province for falsifying her academic record.) The meetings were held at La Ingobernable, a social center in the center of the city which is only one year old, but has racked up an impressive array of activities. La Ingob has developed so fast that a photo in the newspaper El Pais doesn't show the lovely new ceramic mosaic collages in the formerly dismal patio. 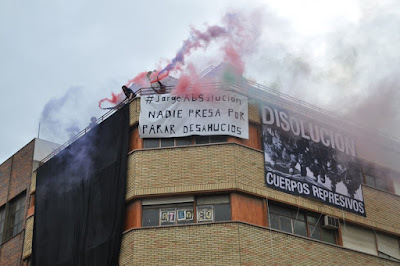 Despite this, La Ingobernable remains under threat of imminent eviction. At left, Emanuele Braga of Macao, Milan, at the IRI meeting. The commons education event was produced by the ever-present Fundación de los Comunes, and a new “think tank” called Institute for Radical Imagination. 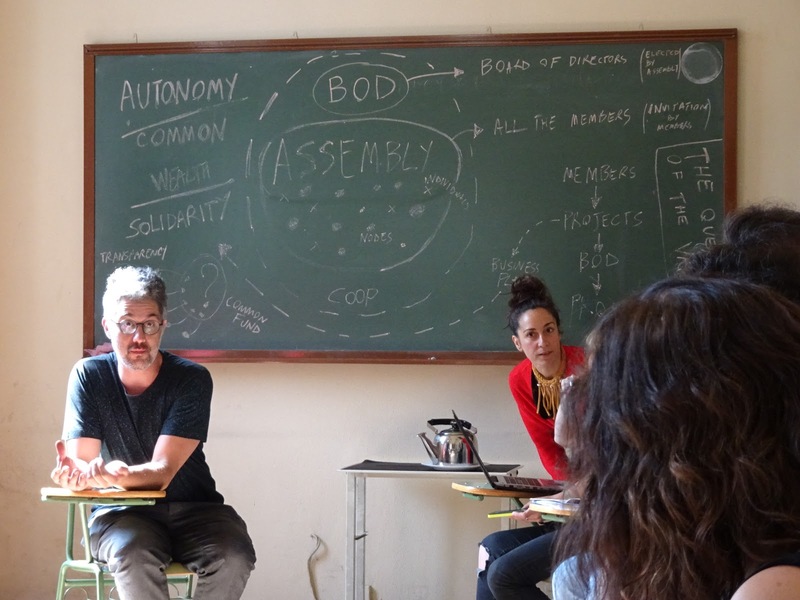 This joint kicked off in November '17 in Naples at the legalized Asilo Filangieri, a "self-managed laboratory of art, culture and theater.” IRI includes people from art museums as well as S.a.L.E. Docks, Chto Delat, Macao, and LUC Athens. Several of the Neapolitans were here on a residency to study "experiences of commoning in the Mediterranean". 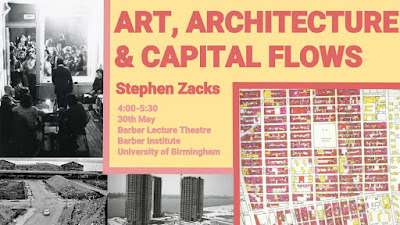 Earlier in May Stephen Zacks was in Madrid, a NYC-based writer on architecture and urbanism. Stephen also founded a public art program in the infamously ruined city of Flint, Michigan. I wanted to show Stephen the new-old wondrous bottom-up municipalist Madrid. We had some great meetings – with the activist architecture collective Todo por la Praxis (TxP), the participation team at Medialab Prado, with professor and ex-museum honcho Jesus Carillo (also sitting in on the “Máster” and the IRI meets). Stephen toured Madrid's collection of citizen-based projects as a guest of Intermediae, during the launch of their “Imagina Madrid” revitalization program for peripheral urban zones. Centro always has something up about urban planning, architecture, revitalization. Troops of kids are always being run through, as if these shows would inspire them to become the active citizens the city so much pretends to desire. There is a continuous kind of pedagogical pressure exerted by all Madrid's cultural institutions in the direction of futurity, thoughtfulness, and engagement. On the other hand, there's everything else – the Spectacle, which is, as it is designed to be, infinitely more entrancing. Thinking is hard. Acting is difficult. Working for money and buying things and paying for relaxing/exciting “content” is easy. Stepping outside of that you encounter rules and police. But back to the “Máster” – Even as a low-speaking guiri (gringo in Madrid), I was able to glean much from the intro and our breakout on the limits of self-organization. Spanish are great on problems. They bear down on them with a deep DIY spirit of fixit. They are critical always, but with the aim of tweaking, oiling, identifying disfunctions as versus proving positions, solidifying identities, fractionating, and fetishizing discourse. That's become a North American habit. The IRI gang had very nice lunches in a back room of La Ingobernable where I chatted with people in English – at the “kids table”, as one of the young ones put it. And, finally, a film screening by Chto Delat concluded the program of the “Masters”. That was some of their long series of vignettes, performances, processions, confessions – all based on an imagining of Zapatista practices, poetry, and ideology. While I love them like everybody else, my study of Zapatismo is pretty spotty. But I did come upon a short text on the AK Press website promoting a recent book that nailed a central problem around all of the institutional and municipalist strivings in Madrid – especialismo. 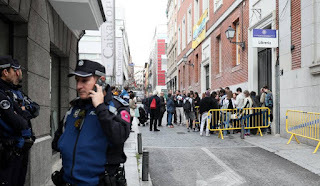 Still, this EU-funded meeting of the IRI in La Ingobernable, attended by the director of the Reina Sofia museum, was extraordinary considering that the police were outside only the week before. 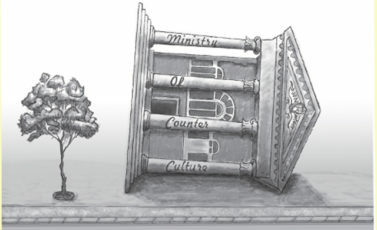 It demonstrated serious commitment to a culture outside official channels. The IRI centered a prospective relation between cultural institutions and social centers. (I write “OSCs” for “occupied social centers,” but l'Asilo in Naples is legalized, so “SCs”, hence institutional, and on the dangerous slope down towards humdrum conventionality.) This putative relation is of great interest, even of some urgency, as it should come up at the MAC 4 meetings in Madrid later this June. At last year's MAC in A Coruña I went to blog it; but I did not visit CSO A Insumisa. It wasn't a site of MAC activity, sponsored by the municipalists of La Marea. No one spoke of it that I heard. Then in late May of this year the city government evicted Insumisa with some violence. What was up with that? The meeting of the IRI in La Ingobernable was by no means the first EU-funded democracy oriented event that's happened there. La Ingob has served as an impromptu short-term conference center for a number of organizations. The other night I saw a briefing on Syria by Amnesty International. To shut it down will bring some big new trouble, which may be what the right wing wants. Clearly the question how the cultural institutions can assist the OSCs is rather vexed. For years it has been by quietly stealing their ideas, poaching their personnel,[NOTE-Poach] and literally supplanting their spaces and filling them with activities overseen by salaried specialists. For me, one clear answer is for the CIs to circulate resources through the self-organized centers. This would be like farmers actually fertilizing and planting seeds rather than waiting for the wind to seed their next crop. Actually this is an old suggestion of artists' movements. The Artworkers Coalition in NYC demanded it of the CIs in the early '70s. They called it “decentralization” – instead the city got separate ethnically-based cultural institutions. Not bad at all, but not the same as was called for. For Madrid, to ask academic artists to ask their students to engage the OSCs, for CIs to site satellite programs in them – all of this seems as if it could be easily done. The experience which young artists and cultural workers get from operating within a self-organized “monster” institution, horizontal, unruly, and popular as it is, can be invaluable. Such an interchange would affect culture in Spain long-term. It would also lead to more OSCs, which are fertile “incubators” for initiatives of all kinds. Indeed, that is the only barrier to entry into the 'school' of the OSC – initiative. More OSCs = more and more diverse culture. And in terms of a healthy democracy, more diverse is better. That's “quality” in art in the 21st century. There was a proof of all this in the brief J.A.C.A. 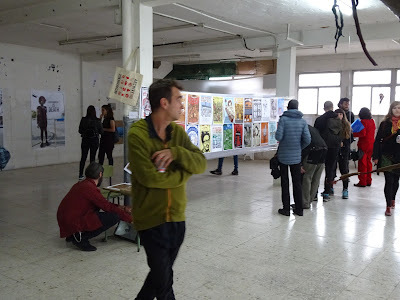 Libertaria exhibition at the ESLA Eko in the peripheral barrio of Carabanchel. The organizers were invited by the Ateneo Libertario de Carabanchel, a traditional anarchist study group meeting in the Eko CSO. For the fourth year, a group of mostly professionally trained artists produced a strongly political exhibition in a squatted space. (I blogged the JACA #3 last year.) The ample 2nd floor of the Eko was painted white, so even tiny and diaphanous works could be seen. I have tired of making proposals to CIs with political content and receiving no response, so this year I participated in the JACA myself as a volunteer curator. I put in a collection of 27 of the over 186 “Peoples History” posters produced by the Justseeds artists' cooperative over the last decade. I am happy to say that it was well received, and attentively studied by many of the visitors to the opening of JACA. [NOTE-SfA]This was the genius of the Storefront for Art & Architecture, founded in NYC in 1982 by Kyong Park and run for years with his partner Shirin Neshat. As artists, we were able to DO something about urban questions, i.e., make art and exhibitions about them. That's something, anyhow. Several important initiatives had their origin there, before it was almost entirely captured by the Columbia University school of architecture. 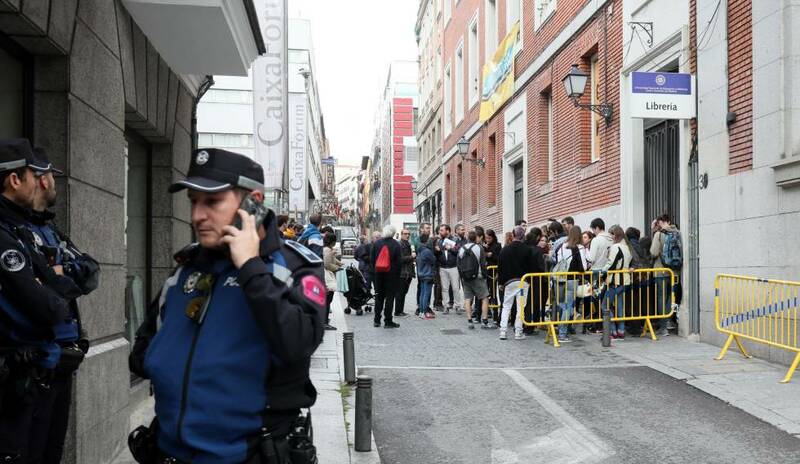 [NOTE-Poach] Any number of artists and workers I've met in Madrid have youthful experience in OSCs, e.g. Basurama, Todo por la Praxis, Campo Adentro, Intermediae, etc. But still the CIs do not directly engage the OSCs. The Cine sin Autor project was poached directly from an OSC.